If K-12 students throughout the southern half of Minnesota do not grow up to be scientists, it will be through no fault of Mayo Clinic's Chris Pierret, Ph.D. That's because in addition to the great work he's doing with young Austin McCoy (a story we shared last week), Dr. Pierret and others at Mayo Clinic are working to bring the joy of science to classrooms throughout the region through a collaborative program called Integrated Science Education Outreach, or InSciEd Out for short. The program, according to Dr. Pierret's Mayo faculty page, is "a collaborative partnership committed to rebuilding K-12 science education curricula for the 21st century." And for the past few years, that "rebuilding" has been happening by way of sharing the "culture, language and practice of science excellence" with students in Rochester and beyond. One school in particular that's experiencing first-hand the benefits of InSciEd Out is Moreland Arts & Health Sciences Magnet School in West St. Paul, Minnesota. Looking for some help integrating health sciences into the school's curriculum, Dr. Pierret tells us, the school's third-grade and fourth-grade teachers came to Mayo Clinic in Rochester for a 12-day InSciEd Out summer internship. The program includes "threads" in genetics, development, scientific dialogue, the nature of science, and the way Mayo Clinic teaches. "During that internship, teachers produce a new curriculum that addresses both the clinical need that we brought forward and the standards that they have a focus on in their classrooms," Dr. Pierret says. This year at Moreland, that new curriculum is focusing on obesity and diabetes. 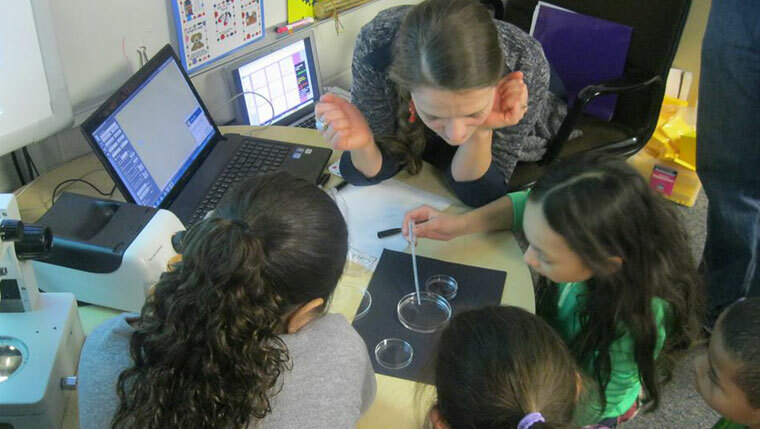 The school district highlights the collaboration with Mayo on its website, noting that third-graders at Moreland "are learning about healthy diets by observing and conducting experiments related to how zebrafish react differently to balanced diets or high-fat diets." Meanwhile, over in the fourth-grade classrooms, students are "working with zebrafish embryos to discover how different types of sugars affect the development of the fish," while at the same time "leading a community wellness project where they help adult volunteers make healthy food and exercise choices." Moreland isn't the only school where students are catching the science bug thanks to InSciEd Out. Dr. Pierret tells us the program is also having a nice effect at Lincoln K-8 Choice School in Rochester. "Before we began the program at Lincoln, no more than 11 percent of the students attended the school's science fair," he says. "Now, 90 percent of them do. And no more than 42 percent of students would select Honors Biology when they went into ninth grade. Now, 95 percent do." Those kinds of results, Dr. Pierret says, highlight the importance of spreading the joy of science through InSciEd Out. "First of all, if we don't do it, who will?" he says. "Second, we want the best scientists in the world, the best clinicians in the world, and the best informed patients in the world at Mayo Clinic. So it's our role in the community to have these kinds of relationships." Build a relationship your peers by sharing your thoughts on this story with a comment below. For several years I have told my son and his wife that I thought the cure to cancer would come from a treatment that where by we would infect the cancer cells thus causing the cancer to destroy its self in fighting the infection. During the fight with the infection the body would cause a high fever to take place and the high temp would aid in the killing of the cancer. Our son works for Mayo in Rochester and today May 18th he sent me a E mail on the story bringing me up more on how I feel about the cure. I might add that a local bone Dr he have heard is now fighting this cancer. I plan to pass this story on to his office. Lets hope this is great news to him.